The factor ran an estate for the laird who owned it. He ensured that the land was being worked as the laird wanted it worked, and collected rents. In some places he had wider powers. 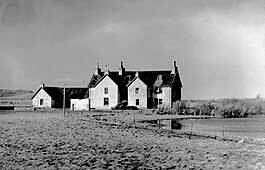 The factor’s house on the Island of Tiree, built by the Duke of Argyll in 1748, contained not only offices and meeting rooms, but also a prison cell. There was also a girnal or meal store to hold the rent paid 'in kind' (goods). Tiree is fertile and enjoys a mild climate. From medieval times, it was known as the granary of the Hebrides.